Heke, a Christian, had a close relationship with missionary Henry Williams, and, at the signing of the Treaty in 1840, he believed Williams' assurances that the authority of Māori chiefs would be protected. 'Governor,' he told Hobson, 'you should stay with us and be like a father. If you go away, then the French and the rum sellers will take us Māori over.' The following day, he was the first of more than 40 northern chiefs to sign (although his signature is fourth, those of more senior chiefs having later been inserted ahead of his). Four years later, disillusioned by the failure of colonisation to bring his people economic prosperity and by the increasing control of the British government over Māori affairs, Heke ordered the cutting down of the flagpole at the British settlement of Kororāreka (which had recently been renamed Russell). This was intended to show displeasure at the British government without threatening Pākehā settlers. Over the following months, the flagpole was re-erected and cut down again three times. The final felling, in March 1845, signalled war between British troops and some northern Māori. He rangatira a Hone Heke nō Pēwhairangi, nō Ngā Puhi (? -1850). He tino reo rongonui, he reo whai mana, he reo i tautoko i te Tiriti o Waitangi. Ahakoa, ka huri ia i muri hei tino pou whakahē i te mana whakahaere o Ingarangi ki Aotearoa. He Karaitiana a Heke, ā, he hoa piri tata tonu ki a Te Karuwhā. I te hainatanga o te Tiriti i te tau 1840, koia tētahi i whakapono ki ngā kī taurangi a Te Karuwhā tērā tonu e tiakina te mana o ngā rangatira Māori. “E te Kāwana,” te kī a Heke ki a Te Hopihona, 'me noho mai koe ki a mātou, ānō he matua atawhai. Ki te wehe atu koe i a mātou, ka riro tō matou mana i te Wīwī, i ngā kaihoko rama hoki.' I te rā o muri mai, ko ia te tuatahi o ngā rangatira 40 neke atu o Te Tai Tokerau ki te haina (ahakoa ko tōna moko te mea tuawhā i te Tiriti ina pānuitia, i te mea i whakaurungia ngā hainatanga o ōna rangatira ki runga ake i tāna). Ka pā te pōuri me te mamae ki a Heke i te whā tau i muri mai, nā te mea kāore te whakatū koroni i whakawātea i ngā huarahi oranga mō te iwi, ā, i te whakangaromia e te Karauna o Ingarangi te mana o te iwi Māori. Ka tono a Heke kia topea te pou haki i te kāinga Pākehā o Kororāreka. Ko te take i pērā ai, he āta whakaatu i tō rātou riri ki te mana kāwanatanga o Ingarangi, engari kia kaua e whakatumatuma ki ngā kaiwhakanoho Pākehā. I roto i ngā marama whai muri, e toru atu anō ngā whakatūranga me ngā topenga i te pou. 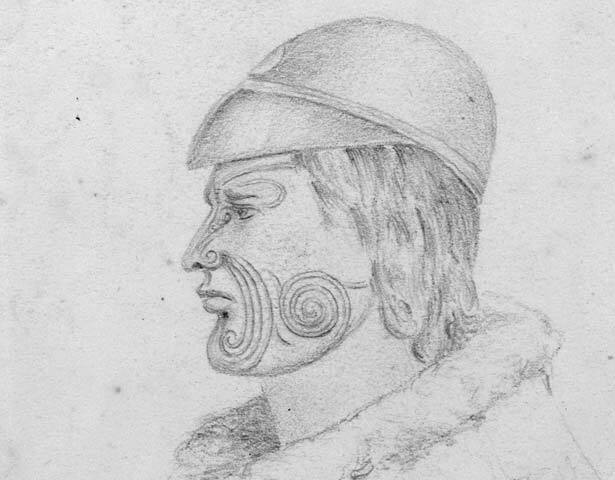 I te tau 1845, i te topenga tuawhā, ka pakanga a Ingarangi ki ngā iwi o Te Tai Tokerau. We have 2 events in history, 40 biographies, 13 articles, 5 comments related to Hōne Heke. Maurice Shadbolt's "The House of Strife" deserves a place here. History is often understood more clearly in good fiction than in a dull catalogue of events..
What does mean mean as in I mean this? Where does that picture of Hone Heke come from? is it authentic? is it a primary source? who drew it? could someone please explain. was he born in 1807? Is that a real picture of him or is it a fake?